This post is FILLED with drool-worthy links! 1. Holy bejezuuuus… this XXL Death By Chocolate Cookie is calling my name. Lordy, Lordy, Lordy. 2. Wow, how awesome is this bundt cake? 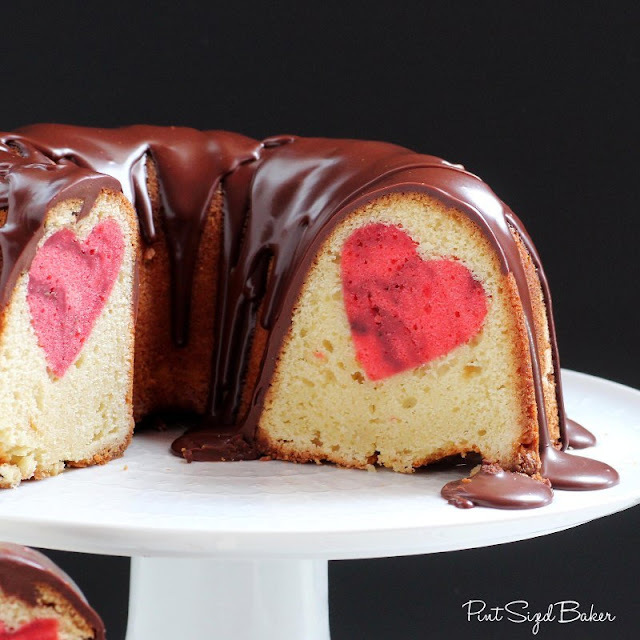 And the name is even better: Make my Heart Pound Cake. Gotta love the creativity! 3. If you’ve never had dessert crepes, you must try them, like ASAP. While my favorites are with Nutella, there is just no way I could say “no” to these Strawberry & Chocolate Crepes. 4. These Raspberry Pudding Bars may not have hearts all over it but I think it’s perfect for a Valentine’s Day dessert – I noticed a little craze with pudding desserts and I love that this is happening. I am a pudding lover. These bars look great! 5. 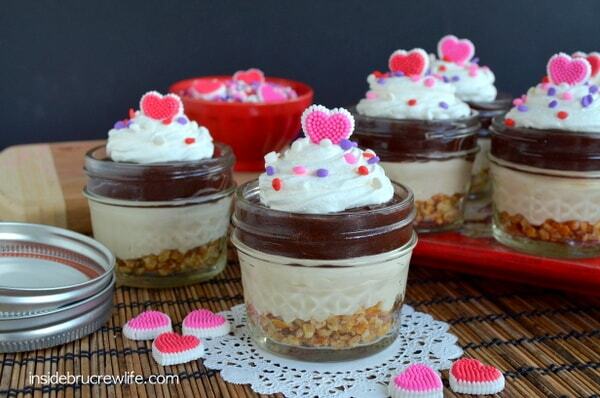 Check out these No Bake Caramel Mud Pie Cups. Ummm, heck YES to every single thing in this title. I love caramel. I love mud pie. And just look at those adorable hearts. 6. I have never had macaroons before. I know, I know. Shame on me. 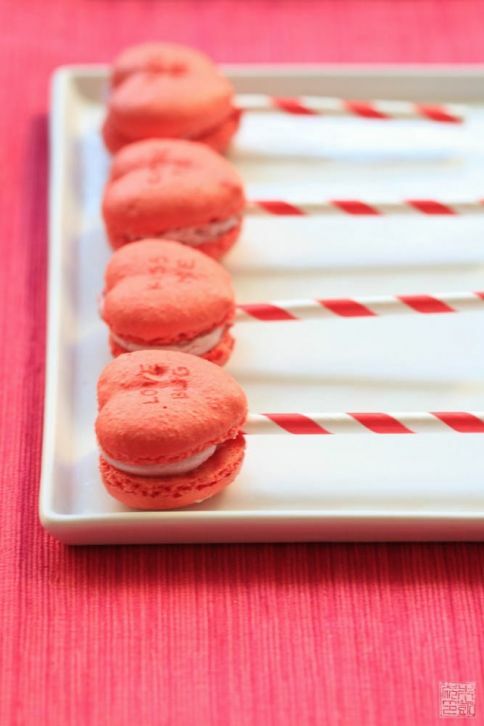 Look at these beautifully pink Macaroons Framboise. Just gorgeous. 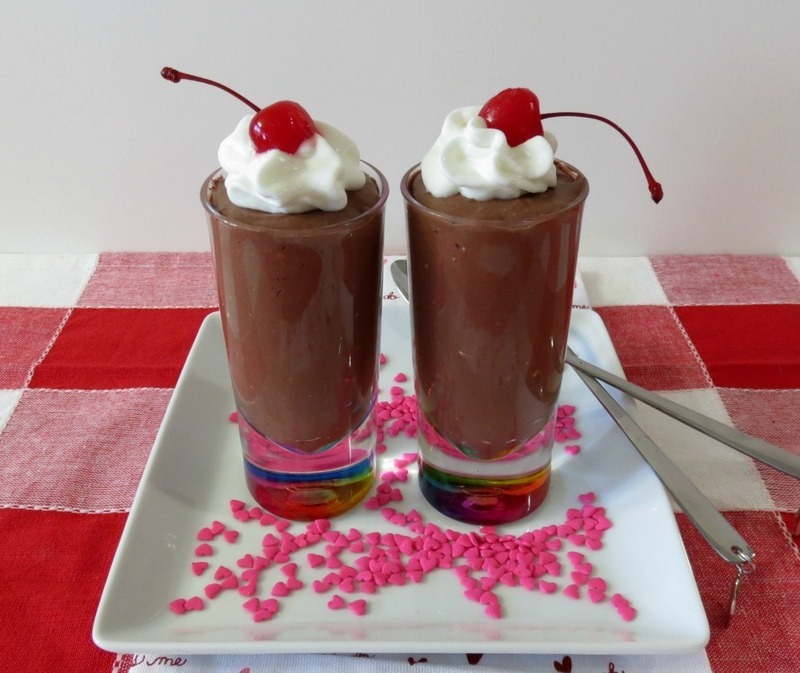 Perfect for a girly Valentine’s Day dessert. 8. 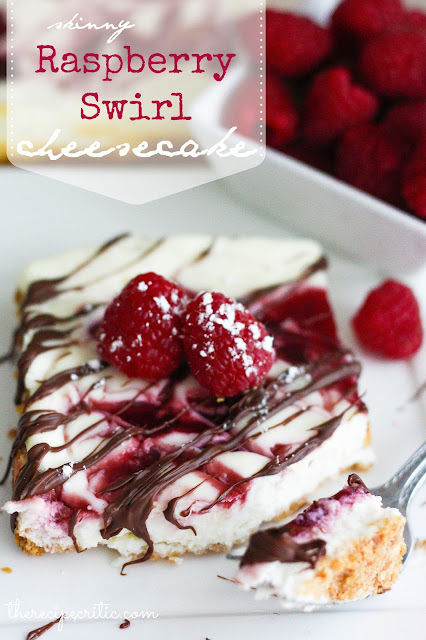 Can I just PLEASE have some of this Skinny Raspberry Swirl Cheesecake? It doesn’t look Skinny in the slightest! Ahhh! 10. I am a sucker for heart-shaped desserts… and if it’s a heart-shaped dessert that also includes chocolate, cheesecake, AND strawberries? I am done. 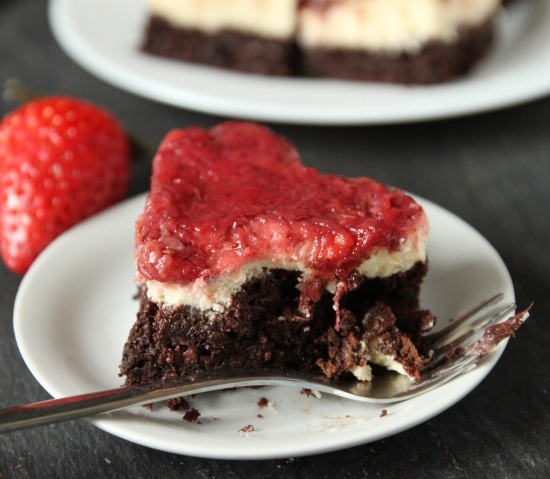 *drooled to death* Amazing 100% Whole Grain Strawberry Cheesecake Brownies. 11. You can’t go wrong with truffles for Valentine’s Day. Like these vegan nut-free dark chocolate truffles. 13. I just love how adorable these Cranberry Shortbread Cookies with Chocolate Glaze. And yes, they are vegan! How awesome! 14. Look at these cute Zesty Pink Lemon Coconut Chocolate Bites. Such adorableness. 15. Convesation Heart Macaroons. Again, I never had macaroons before but I want to try them already. I love the little adorable messages these bear! “Love Bug” – so cute for Valentine’s Day, better than those little candy heart messages. Whew, that was a whole lot of deliciousness. Hope you enjoyed. What are you favorite Valentine’s Day recipes? Links welcome! Ohhh Amanda, same here! I couldn’t help myself. Huge cookies also remind me of high school, we had those huge chocolate chip cookies in the vending machines that were freshly baked every day.. Good times. Oh my gosh, you are killing me! lol I want everything you posted!!! Everything! My sweet tooth is calling me! Thank you so much for including me in your round-up. You picked some awesome recipes!!! Bahahahaha I love how you pixeled out part of that first picture. Too funny! Um, yep, that XXL Death by Chocolate Cookie is happening in my apartment on Easter. No questions asked. Darn church calendar and Valentine’s Day did not line up nicely this year, so no chocolate for me this year 🙁 Laaaaaaaame. You weren’t kidding! Amazing goodies, girl! Everything looks amazing! I think I’d love that giant cookie most though! Everything looks SO good! And that bundt cake… whoa. Definitely going to check out some of these recipes. Thanks for including mine! Oh my golly I want to BAKE now!! It’s going to be finish of mine day, however before ending I am reading this wonderful article to improve my know-how.